Hey everyone!! I officially began my road to good health yesterday. I ate under my calorie goal and even went a step further and the hubby and I did some Zumba! I never in a million years thought I would say this but that Zumba was the funnest workout I have ever done! I am embarrassed to say that we have had these Zumba dvd's for well over two years and have never taken them out of the box. Sad sad sad... We had a good time but will have more when we learn the steps! I am determined to keep it up!! Any who...I am entering the Crumpet's amateur nail art contest. I hope to be able to make it into the finals. Since I am a super newbie I am asking that all of you vote for my design if you like it! No pressure! I still want to share it with you though. I chose to do a "skittle" manicure. I have a problem with being matchy matchy sometimes so this takes me way out of my comfort zone!! I used a base of two colors only. The blue is OPI Ogre the Top Blue (One of the most beautiful blues I own!!) and OPI My Boyfriend Scales Walls. I used one coat of Ogre the Top Blue and then applied Color Club Beyond the Mistletoe. For some reason I think a good skittle or skittlette mani has to have one glitter nail. 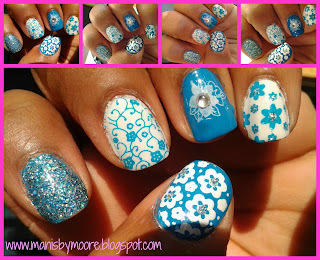 On the pinkie I stamped with Mash image plate 45 using Sally Hansen Insta Dri Brisk Blue and filled in the center of the flowers with Color Club Beyond the Mistletoe. On my ring finger I used Mash white stamping polish to stamp a flower from Konad m82 and filled the center with a clear stone. On my middle finger I stamped with a fauxnad (Konad dupe plate same plate but not Konad but just as good) m73 with Sally Hansen Insta Dri Brisk Blue. Finally I used Cheeky plate CH 50 (This image was horrible to stamp) and stamped with Sally Hansen Inst Dri Whirlwind White and filled in the center of the flower with Color Club Beyond the Mistletoe. Wow there was a lot going on. 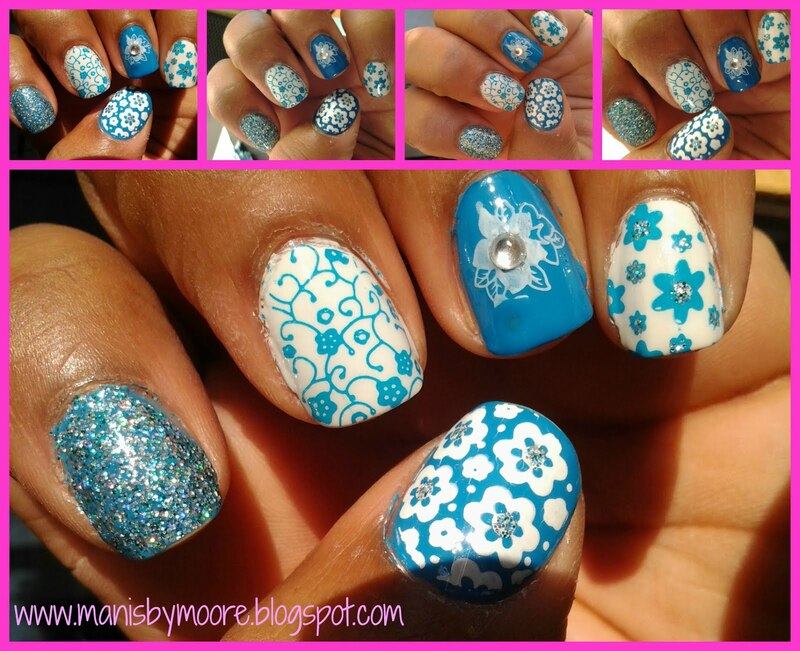 I think this is my best mani I have shared on here yet!! I hope I win! Thanks for stopping by and sorry for all the words! Have a good day! Love this....good luck :) I too have started a healthy "thing"....what zumba dvd's do you have, I am wanting to get some ??? Thank you so much! Your opinion means a lot to me cause your manicures are awesome! Well I have the 7 pack that I am scared to touch because I watched them and got tired looking at it. I also have Fitness Concert. We have been doing the Zumba Rush though. It is a 20 minute workout that will really work you out!! You will sweat 2 minutes in! I love it! Thank you so much! Those colors were really pretty together! !